Last week was a bit of a debacle because I was without a phone for a brief stint (I dropped it one too many times and went from I'll Just Continue Using My Phone Despite This Giant Crack in the Screen to I Can Literally No Longer Operate My Phone and Must Get it Fixed ASAP within seconds). No phone meant no pictures, which means a delicious vegetarian lasagna was constructed from scratch but there is no photographic evidence to share on the blog. Just know that after our baby arrives, the lasagna waiting for us in our freezer is a cheesy masterpiece stuffed with homemade seitan, mashed sweet potatoes and spinach. Also as you can see in this post, I did have my phone around when I was making a vegetable barley soup. All is not lost. 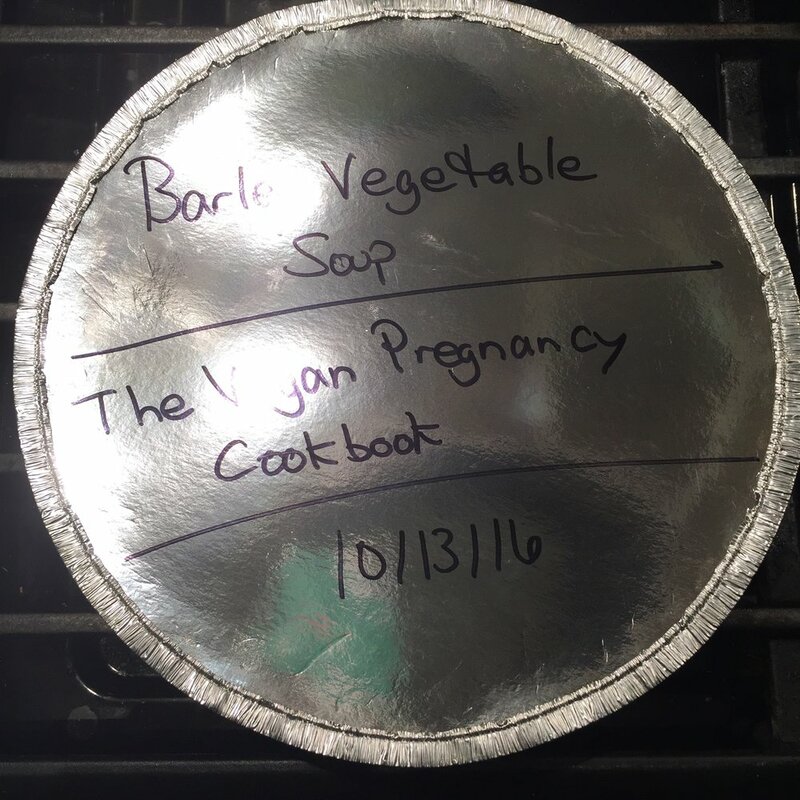 For this vegetable barley soup recipe, I turned to The Vegan Pregnancy Cookbook. This book was instrumental to me, especially early in my pregnancy. As I've mentioned before, I couldn't even THINK about dairy or eggs without getting sick during my first trimester. I became a default vegan until I could stomach the ingredients again. My egg and dairy consumption remains significantly less than what it used to be, but I'm now back to eating non-vegan ingredients at least a few times a week. During early pregnancy, though: no way. This book was a godsend. Tomorrow I will be 37 weeks pregnant. I can reasonably expect to give birth in 1-5 weeks. Making it this far into pregnancy is surreal because here I am, uncomfortable and cumbersome, foreign in my own body, the most unlike myself I've ever been. On the other side of all of this a tiny person will greet me and become my own. I'm so excited about motherhood because I feel like in some ways it's the most "me" I'll ever be. The love I have for this baby is ready to pour out of me. In the meantime, I sit here uncomfortably waiting. Today I read an article about the idea of becoming a mom without becoming a mommy, i.e. entering motherhood without losing a sense of self-identity. In some ways pregnancy feels like a losing of oneself, which I assumed would translate mainly to my body. I've found it's seeped into other facets of my life, too. I've lost interest and drive in certain areas, though I'm not convinced that this is entirely bad. As a writer I've always had a scrappiness that's allowed me to devote myself to projects even when they didn't fully hold my interest. In pregnancy I feel too tired for all of that. I'm too tired to sell myself to editors or to try and write in a way that matches the vision of a company that's not my own. I don't feel like spending my hours doing work I don't love right now. That's a gross and privileged thing to say — let me own that upfront. It's also a true thing to say. Pregnancy is a weird process that brings up a lot of pure and crystalized feelings. I'm too tired for the rest. Am I really losing myself or am I becoming more myself than ever? I love the idea of becoming a mom and not a mommy, of loving and nurturing a human without denying the interests that drove me long before baby came along. I think in particular for women who plan to stay home, the danger of immersive baby and kid culture is real. One minute you're a writer, runner, cupcake baker and book lover. The next you're a mom and housewife whose daily schedule revolves around a tiny human. I'm not saying I'm not excited to care for this tiny human — I am, more than I can even express. I'm saying there's a lot of pressure these days to become a certain kind of mom — the one who packs lunches that look like pieces of art and volunteers to coach all the activities and makes homemade costumes for playtime and hosts weekly playdates that include laboriously prepared appetizers and drinks for the other moms and joins all the Mommy & Me groups and goes from activity to activity and stays up all night gluing pieces from Pinterest-inspired art projects and dresses her kid like a mini fashionista and documents every moment on social media, all while keeping up with the housework and making nutritious yet delicious dinners (and breakfasts, lunches, and snacks) every day. If I become that kind of mother, when will I ever write another book? When will I go for a run? When will I spend time with my husband? When will I sit down with my child and just read and cuddle and be there and not worry about going somewhere or doing the next thing on the list? By mentioning any of this, I've already entered the dangerous territory of coming off like I'm judging other mothers. There is nothing wrong with Pinterest-inspired craft projects. There is nothing wrong with volunteering to lead your child's activities. There's nothing wrong with wanting to make your kid's sandwich look like a frog or pirate or ladybug and there's nothing wrong with keeping a clean house. Where things get tricky, I think, is when that pressure seeps in to try and do ALL THE MOM THINGS to the detriment of some or all of the Woman In the World things/ friend things/ spouse things/ independent person things. Do I plan on being ridiculously devoted to my child? Am I ready to give away my time and space and energy and love in a way I never have before? Absolutely. I'll be the first to say it: this little person is going to be my world. I will do anything and everything I can to keep this person safe and happy. But I also want to write another book. I want to return to running. I want to read and bake cupcakes and spend time with my husband, family, and friends. I don't want to feel like a housewife (I frankly already feel like a housewife. It's impossible to work from home and not devote a big chunk of time each day to housework. It's there, in front of you, always.) I don't want to feel like MORE of a housewife. I want to feel like a person who has some semblance of balance despite the level of devotion required for this motherhood position. I think that everything I'm saying is important for me, but I think it's important for my child, too. I want my kid to look at me as a complete person. I remember all the Mom and Dad moments from my childhood, but I also remember my mom as a potter and self-employed businesswoman. I remember my dad as a newspaper editor and tennis player. I remember our shared love of Mexican food and family bike rides, of road trips to Colorado and time spent outdoors. My mom made me a lot of clothes and Halloween costumes, but she had both the skill and desire to do so. My dad made a lot of elaborate meals, but he had both the skill and desire to do so. I do not feel that either of them lost themselves to parenting and although I've never asked, I hope they don't feel that way either. (Perhaps if I did ask, I'd learn a few things. Maybe someone wishes all those Saturday afternoons on soccer sidelines were spent in a yoga class instead. Maybe someone wishes another caregiver had been in rotation to give respite from the endless afternoons with us running around. I don't know, although I'm now curious and will make a point of asking soon.) Maybe it's impossible not to lose yourself just a little in the act of parenting, or maybe I'm blowing the entire thing out of proportion. I won't know until I get there. I'm going to have a baby soon and I cannot wait. I'm also going to keep writing, though not necessarily for other people. I'm already giving so much of myself to this one person — maybe I'll try and retain a little bit of my writing identity and make something of it in my own way. Financials are always scary but giving myself away to something I don't truly believe in is scarier. I'm going to believe in my own abilities. I'm going to believe in the relationship this sweet baby and I are about to form. I'm going to believe in our ability to navigate and figure out this new world together. I'm going to believe that I'll find my place again while remaining at home with a child. I'm going to believe that all-consuming "mommyhood" and devoted motherhood are not one at the same, and that I can be good at one without losing myself to the other.